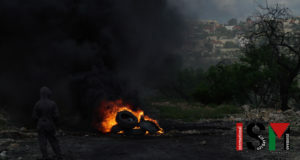 On Friday the 30th of March the weekly demonstration was held in the village Kufr Qaddoum outside of Nablus. This day was however the same day as the Global March to Jerusalem, meaning less media attention than normal, and also less internationals present as most of the activists attended the demonstrations in Qalandiya, Jerusalem, and Bethlehem. To further minimize attendance, the Israeli soldiers had set up a checkpoint outside the village, preventing people from entering. The situation was also more tense than usual, as it was only two weeks ago the IOF (Israeli Occupation Forces) released attack dogs on the demonstrators, resulting in savage attacks and sever injuries. Despite these facts approximately 500 people, including about 10 internationals, gathered after the Muslim Friday prayer to march along the main road of the village that the IOF are still obstructing even though the Israels court has approved its reopening. “As we approached the road block we could see that there were a lot of soldiers, approximately 35, and they had brought a tractor and the ‘skunk water’ truck,” said Odai Al-Jumah, a film-maker from the village. When the demonstration reached the barbwire road block, they were cheering and started to talk to the soldiers through a megaphone, demanding the reopening of the road. As normal the soldiers responded to this non-violent action by shooting tear gas, stun grenades and skunk water. But this time they did not shoot upwards to make the metal tear gas canister fly in an arc, but instead they were illegally aiming right at the crowd just 20 meters in front of them. “I was standing on the side of the demonstration, filming when I saw one of the soldiers aiming at me. I had no where to run, so I just covered my head with one of my arms,” said Al-Jumah. Luckily he was fast enough. The tear gas canister would have hit him right in the face, but instead it hit his arm and then ricocheted down to his chest. Tear gas canisters are a fatal weapon used by Israel against nonviolent protesters, using the crowd dispersion weapon as a projectile directed at destroying human life, as was the recent case of Mustafa Tamimi of Nabi Saleh. He ran a few meters and then collapsed. He got picked up buy the Red Crescent staff who carried him to an ambulance where they decided to take him to a nearby hospital. On the way they had to cross the checkpoint where the soldiers stopped them. They wanted to interrogate Al Jumah. He was then interrogated for more than half an hour, a very long time as he had sever pain in his arm and chest. After asking over and over again what he was doing at the demonstration, and if he had thrown any stone, they let him go as it was obvious he was there to document and was not even a part of the demonstration. The obvious delay to reaching any medical attention is one of the many ways Kufr Qaddoum and villages throughout Palestine are impacted by Israeli checkpoints, road blocks, and longer detours sustained by the illegal Israeli occupation. Al Jumah was then taken to a hospital in Nablus where they found no serious injury, but he had to spend the night under observation. The soldiers were apparently very violent through out the demonstration as more then 30 people were injured, most of them from inhaling very significant amounts of tear gas. Five were shot directly with the canisters, including the press who were merely documenting Israeli violence and lack of concern. In February Reporters without Borders released a statement condemning Israel’s targeting of journalists. The Israeli violence did not conclude with the demonstration but continued in other forms of oppression and harassment. On Sunday April 1st four soldiers came into the village and violently entered the house of Murad Shtawi, one of the organisers of the demonstration who was recently arrested by the military. “I was out for a walk when people from the village said there were soldiers in my house,” said Shtawi . He ran back to his home, and when he got there he asked the soldiers what they wanted. They showed a picture of his six year old son, saying the child was suspected of throwing stones. The family was shocked, and started screaming at the soldiers, chasing them out of the house. The soldiers then went back to their military jeep, leaving the village empty handed. “They really have no limits. What possible threat can they see in a six year old boy?” asked Shtawi. This is a question Shtawi, Al Jumah, or the locals of Kufr Qaddoum will not get answered. The collective punishment and practice of fear tactics exercised by Zionist military and settlers against the indigenous people of Palestine and their supporters is simply central to the strategy of Israel’s apartheid. Axel is a volunteer with International Solidarity Movement (name has been changed).